This post is sponsored by Wines from Rioja. All opinions are my own. One of the things we missed most during our Local Thirty experiment last September was tasting flavors from other parts of the world. We were pretty strict during the 30 days of September and to be honest, we’ve been eating pretty similar ever since. We discovered so many wonderful local ingredients that we didn’t know existed in our corner of the world (ghee, olive oil, ginger, turmeric, spices, all the ethically produced meat, dairy and veg) but with that being said, there were still things we missed. And because it is really important to us to continue to eat local most of the time, we also don’t want to deprive ourselves of the amazing privilege that we have to taste the flavors of the world. One of my goals for 2019 is to host a monthly dinner at the farm where we highlight another region. Whether it’s southern food, Spanish food, Indian, French, Italian, Chinese, Moroccan etc, I want to celebrate the flavors of the world. And it doesn’t just stop at the meal, tasting different wines, beers or sprits is something we absolutely love. 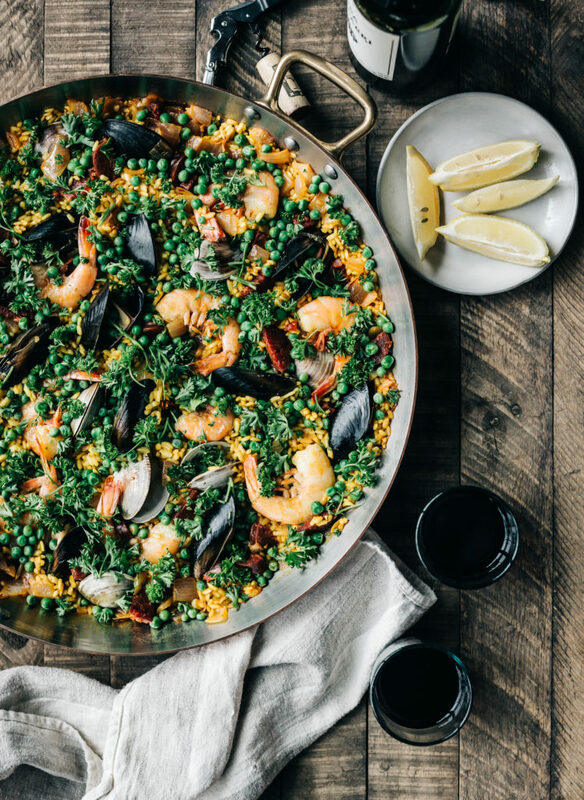 This month we teamed up with Wines of Rioja to bring you this amazing paella dish that pairs well with the food friendliness of all Wines from Rioja. This dish is spicy (thanks to the chorizo) and bursting with bright and fresh flavors that will wake up your taste buds and lift your sprits in the dead of winter. I was a little nervous that paella would be too labor intensive but the fact is, this dish was pretty straight forward to make and we absolutely devoured it. Paella is definitely a meal that is meant to be served with friends and tasty wine. So call the neighbors, crack open some Rioja wine (bonus it’s bottled and ready to drink right away, no need to age!) and escape wherever you are for just an evening and transport your tastebuds to Spain. In a medium saucepan, combine the chicken stock with the fish stock and crumbled saffron and bring to a simmer. Meanwhile, in a 15-inch paella pan or large dutch oven, heat the oil over medium high heat. Add the onion and cook, stirring occasionally, until softened. About 5 minutes. Add the garlic and paprika and cook until fragrant. About 3 minutes longer. Add the rice and cook, stirring often until it begins to toast up a bit, add the wine and cook, stirring occasionally until most of the liquid has evaporated. Drizzle in the hot broth and stir the rice to evenly spread it in the pan. Cook over medium heat, without stirring but rotating the pan for even cooking, until half of the liquid is absorbed, about 15 minutes. Reduce the heat to low. Nestle the chorizo and shrimp into the rice. Add the clams and mussels hinge side down and cook, turning the shrimp halfway through, until the shrimp and shellfish are cooked through and all the liquid is absorbed, about 18-22 minutes. Scatter the peas on top and let stand for 5 minutes. Garnish with parsley and serve warm with a few glasses of red. Oh I love paella and you are right it has a warmth that begs to be shared with a group of friends, not to mention it usually serves a crowd. It’s always been on my recipe to do list and this looks very approachable. Thanks for the inspiration! Cheers to your monthly dinner parties! Let me know how it turns out! It really wasn’t hard to prepare at all! Cheers! This looks great and I haven’t had paella for years now. Gonna try and make this this weekend. I love any reason to get my Dutch oven out too. I might double the shrimp to be greedy 🙂 Thanks as always for the yummy recipes!